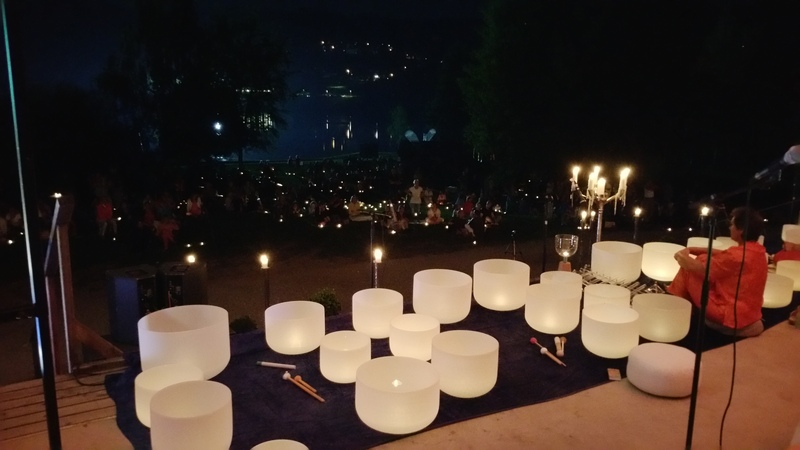 Amadea Stefa and Martin Veigl spread Love Peace and Harmony and other sacred mantras by joining with various musicians for music and dance concerts in different communities. They have done concerts in Graz, Voitsbert, Bibersteinsee, Deutschlandsberg and more from August 2015 to July 2016, with from 30 – 400 people in attendance. Through the fun and joy of live music, Amadea and Martin teach concert participants the sacred soul song of Love Peace and Harmony line by line, with simple hand movements. Then they all chant together. Sometimes each person burns a candle for a better world or to bring more peace, for example, between refugees and natives. According to Amadea, participants have reported feeling more peaceful in their hearts and some have reported healing of emotions, relationships and more during the events. Many shared that their way of thinking about Mother Earth, animals and nature, religion or refugees was transformed. For some, the concert was their first real connection with a higher source, such as the angels and saints, and their lives changed dramatically. The next concerts will be in Lanzerotte and Italy!